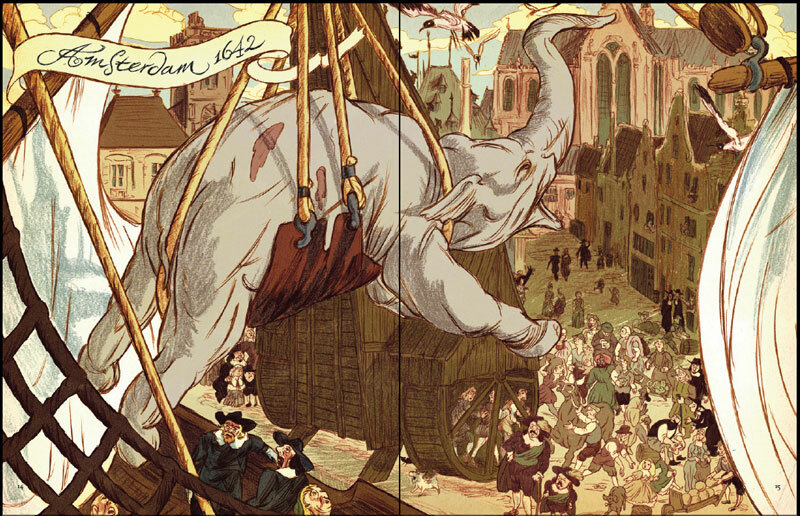 Typex’s magnum opus, a biography of Rembrandt in the form of a graphic novel, opens with images of an elephant. Burly yet vulnerable, ungainly yet with kind eyes: this is how Typex depicts the elephant as a metaphor for one of the giants of the painting world, Rembrandt van Rijn (1606-1669). In eleven chapters, each named after key figures in his life such as his wives Saskia, Geertje and Hendrijckje, Typex tells the story of a man whose painting enabled him to do everything: grow rich, seduce women, understand people. Rembrandt was not a handsome man but he was sensual. With his sensuous lines, Typex is the ideal graphic novelist to draw him. Rembrandt’s tuberous nose, soft cheeks and sly eyes give the illustrator great scope to experiment. The drawing techniques used here have been inspired by Rembrandt’s own, with his excellent eye for the details of imperfection. Rembrandt’s renowned intimacy and humanity come out particularly well in this book. This is no remote idealisation of a genius, but an intimate portrait of a man who could be difficult at times. Typex keeps the narrative lively with an almost choreographic representation of his character’s movements, and varies his formats to continually surprise the reader. He also plays a sophisticated game by reflecting Saskia’s moods in the artist’s brushstrokes, having him literally paint over her in dark umber tones – symbolic of his dominating attitude towards women. The larger tableaux which portray Rem­brandt at full-length are enthralling; we see him both proud and vulnerable in an increasingly dark studio as the end grows near. Here’s to the greatest Dutch artist… I mean the second greatest. First there was Rembrandt, then there was Typex. Rembrandt (2013). Fiction, 238 pages.